Vincas Svirskis, one of the most famous Lithuanian crafters of crosses and the most talented creators of the old Lithuanian folk monumentalism, was born in Krekenava town in 1835. His biography is shrouded in legends and can be traced only from the stories of people. His image remained verbal only, transferred from the lips of one person to another. He was a self-taught loner, without a constant roof over his head, and was considered to be strange during his time. All of his life, he travelled by foot from one village to another, as if marking his road: by stopping where people wished to decorate their homesteads and roadsides with his beautiful hand-made creations, or give meaning to important events of their life. The priests did not appreciate Svirskis crosses, called them "balvonas" and refused to bless them, as most of the saints are portrayed as villagers (their sanctity is only expressed with attributes). And sometimes saints were portrayed as self-satisfied, proud lords with a kneeling sinner asking for forgiveness. It is assumed that V. Svirskis attended a parish school of Krekenava, and learned how to carve wood while working as a shepherd. He maintained connections with book smugglers during the years when press was prohibited. V. Svirskis works decorated Krekenava, Surviliškis, Ibutoniai, Žibartoniai, Miegėnai, Pakruostė, Josvainiai, Krakės, Grinkiškis, Gudžiūnai, Vandžiogala, Babtai and other villages. V. Svirskis created more than 200 crosses throughout his life. 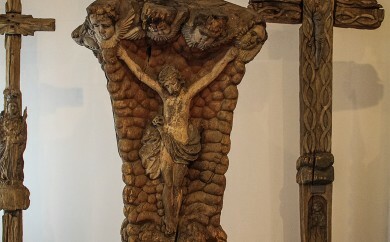 His crosses were made only from oak - the saints and ornaments for crosses were carved from the same wood. He decorated his crosses from all sides with low-reliefs and high-reliefs of saints, as well as with the images of plants and animals. As he himself said, "I want my cross to be beautiful from all sides, no matter the angle that it is viewed from by a person". 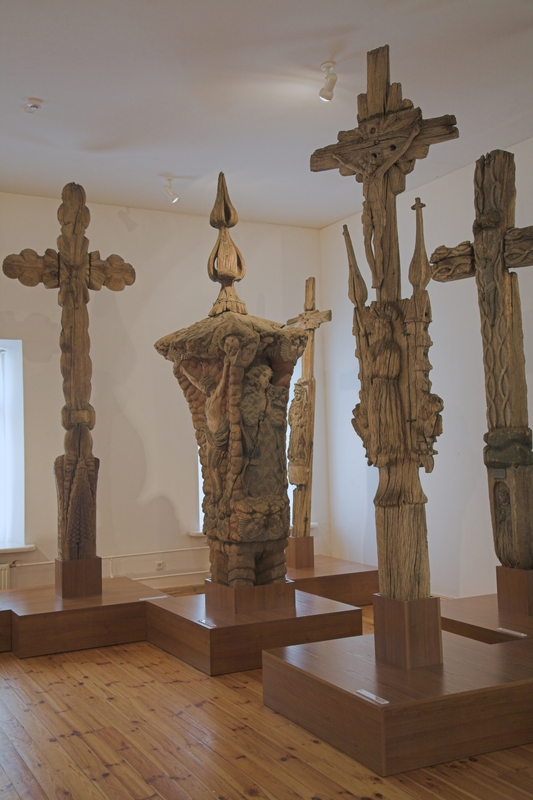 He carved crosses and shapes of compositions from a monolithic oak, therefore he would joke that the saints will "never fall of" the crosses. V. Svirskis would paint the crosses to preserve them better. He would only work when his thoughts were clear, because "the work would be for naught if there is any kind of nasty words in my mouth... I start my work from the early morning with God's words...". He would sing holy chants while working. His sculptures are of expressive plastic, complex composition, monumental and decorative characteristics with a Baroque style. The sculptor's ideas were also influenced by the landscape and relief of places where his works would be built. 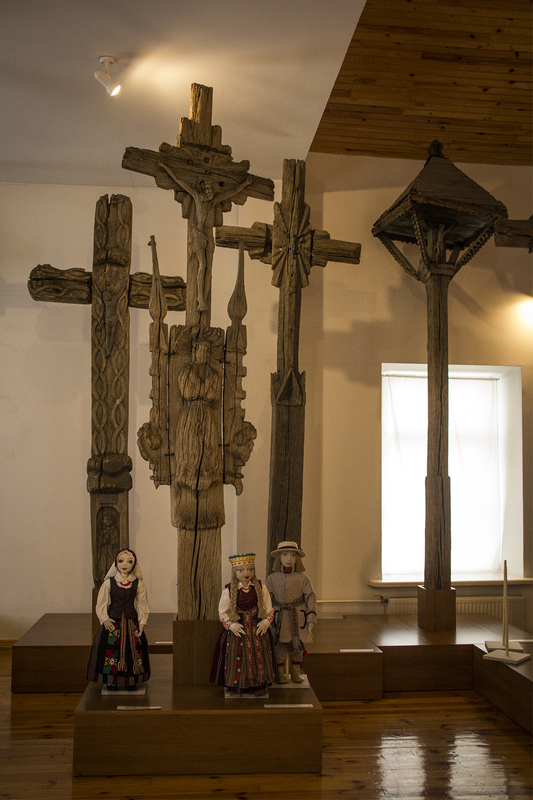 Only 50 works remain out of 230 crosses and chapel columns considered to be the masterpieces of the little Lithuanian folk architecture. Vincas Svirskis died at the age of 81, on 7 March 1916. 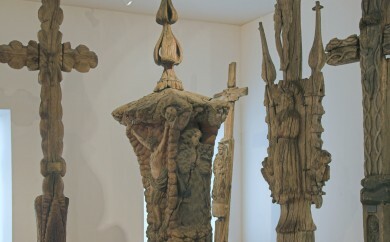 The poor eccentric turned out to be an artist who surpassed his time and his people, and whose crosses, original and unique in their art form, are preserved in museums. 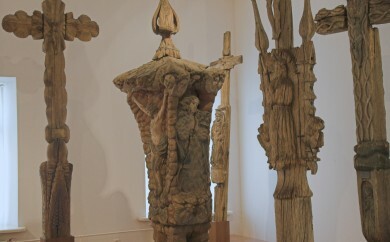 After viewing his works in Kėdainiai Regional Museum, foreigners often say that: if the author of these works would be, say, an Italian, he would be known across the entire Europe". And, according to the art critic I. Kostkevičiūtė, "if the Polish people would have had their own Svirskis, he would be presented in Paris – the capital of art a long time ago". 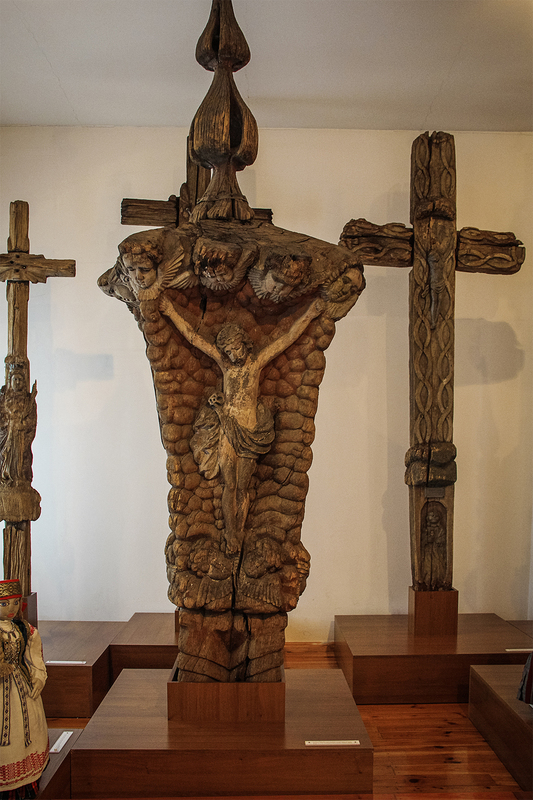 His crosses can be viewed in Kėdainiai Regional Museum, Lithuanian National Museum, in the fields and homesteads of Kėdainiai and Panevėžys districts, in Krekenava and Paberžė churches. 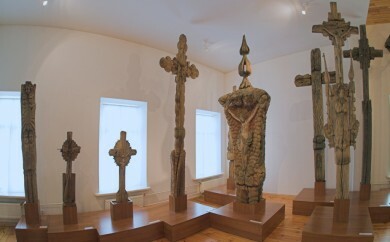 UNESCO takes care of the preservation of the unique heritage of Lithuanian cross crafters – in 2008, Lithuanian cross-crafting and cross symbolism were included in the UNESCO Intangible Heritage List. Monument created by Algimantas Gilius was uncovered on 22 July 1989 in Surviliškis cemetery. In August of 1996, the sculpture was transferred to the courtyard of the school named after V. Svirskis. 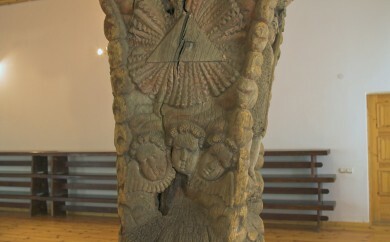 The stone sculpture is comprised of three parts: concrete pedestal, middle part with an inscription: "To commemorate Vincas/ Svirskis/ (1835-1916)/", and a triangle upper part with a carved image of "Rūpintojėlis" and the year the monument was created: "1988". This cross was transferred from Pakruostė village in the summer of 1996. The monumental cross portrays the high reliefs of St. Aloyzas and St. Ona teaching Mary. It was created in the end of the 19th century. Vincas Svirskis was burried in the old cemetery of Surviliškis, in the family grave of Mataičiai. Former manager of the Bank of Lithuania Romualdas Visokavičius helped restore the grave of V. Svirskis, as his mother is related to the cross crafter. 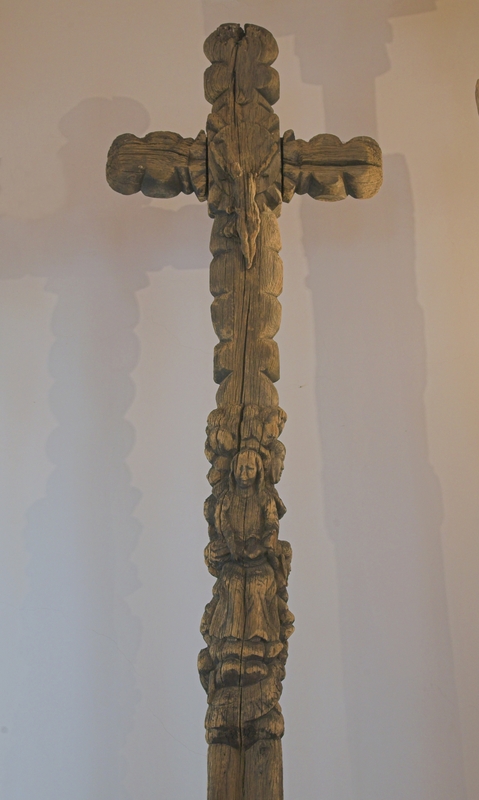 The wood carver's grave is decorated with a copy of a cross which was once made by him. 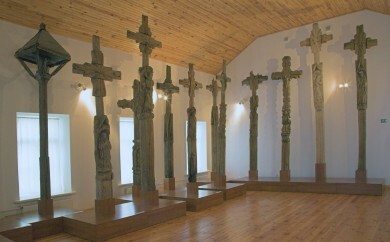 The original cross is preserved in Kėdainiai Regional Museum. The brass plate of the monument includes an inscription: ,,...let there also be a monument for me“. Father Stanislovas was the first one to be concerned with the crosses of Vincas Svirskis. He gather the cross collection of Svirskis from the region and stored it in his church. It is likely that the altar of Paberžė Church was created by Vincas Svirskis. 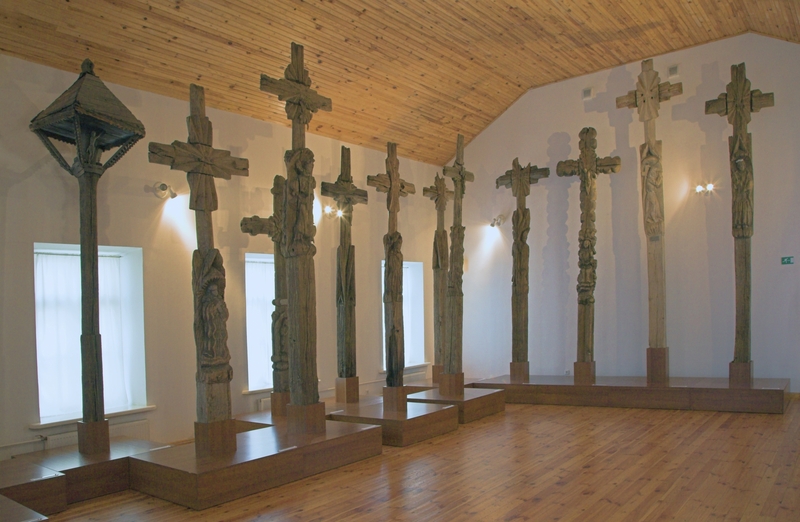 In the 1863 Uprising Museum, 5–12 grade pupils can order an educational programme "Symbols of Paberžė – suns, chapel columns, roof columns, bowl stones". 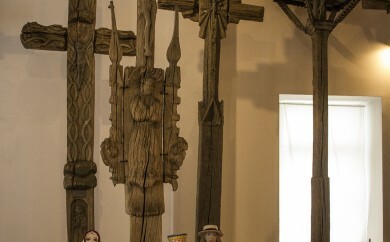 For a long time, part of the collection of the crosses of Vincas Svirskis was stored in the attic of Kėdainiai Lutheran Church. In 2000, they were transferred to Kėdainiai Regional Museum. Museum Director Rimantas Žirgulis, who was managing the transfer of the crosses at the time, remembers that the crosses were lifted onto the second floor with a crane through the window: "stunned bypassers observed how massive crossed swayed above the narrow Old Town street, and I was wiping away sweat thinking that the wood will shatter into many pieces if it unhooks and falls down". The transfer ended succesfully. 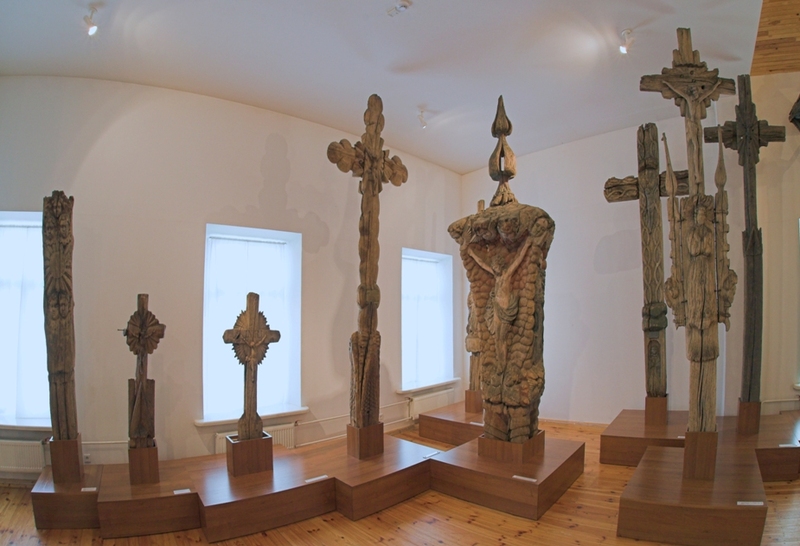 For twelve years, the crosses of Vincas Svirskis were one of the most impressive expositions of Kėdainiai Regional Museum. 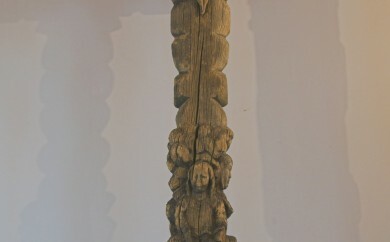 There are 18 crossed exhibited in Vincas Svirskis Hall of Kėdainiai Regional Museum. 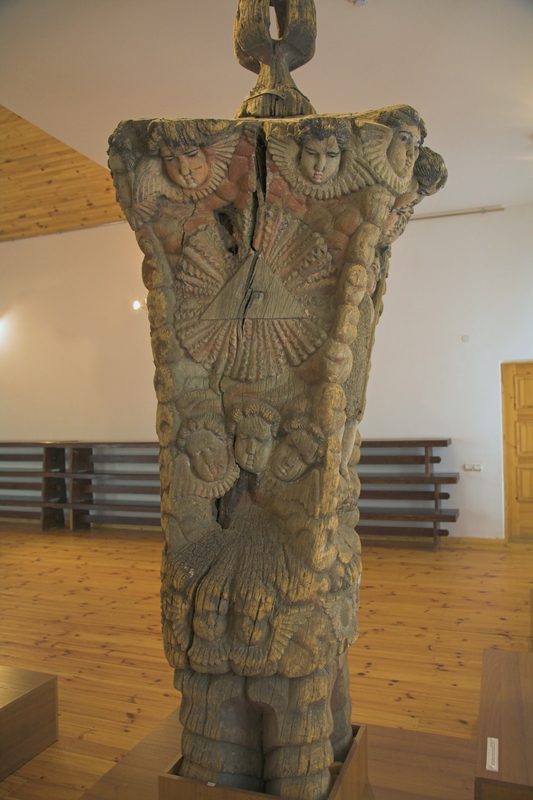 The museum has a prepared educational programme "Old folk sculpture. The symbol of the Cross", during which information is provided about V. Svirskis, his life and works, and his written thoughts. Pupils paint the exhibited crosses, some of their details or the entire cross exposition. you will learn about the traditions of Lithuanian folk wood carving, cross-crafting customs in Lithuania, work tools used in wood carving and wood processing technologies. You will learn about the basics of the carving craft, will have the opportunity to discover an artist within you and create an original work of art yourself. Programme manager – traditional craftsman of certified product international heritage Audrius Vasiliauskas. 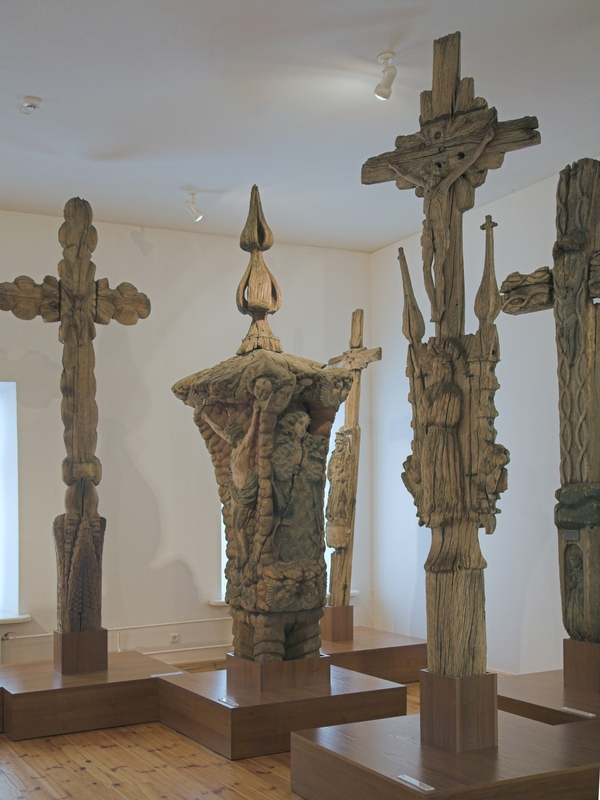 The Museum of Wooden Sculptures by Vytautas Ulevičius meaningfully interconnects with Vincas Svirskis expostion of crosses in the town's museum. 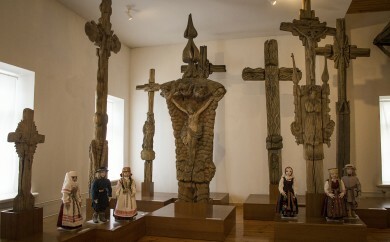 The Museum of Wooden Sculptures by Vytautas Ulevičius was established in 2004 in the facilities of Kėdainiai District Municipality. 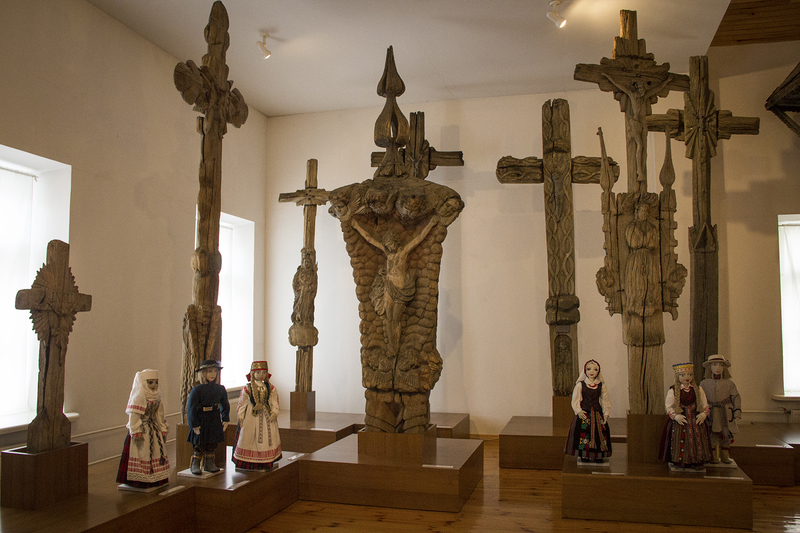 This area exhibits more than 50 works of the well-known wood carver Vytautas Ulevičius (born in 1934) living in Krakės, Kėdainiai district. Kėdainiai Region Cultural prize winner, twice nominated to be the Carver of Carvers of Lithuania, he gifted this collection of his works to the people of Kėdainiai region. The starry world of his sculptures is distinguished by its splendor, decorativeness, stylized storyline, particularly the ornament... He is inspired by Lithuanian folk art. His works is an extention of chapel column structure and stylistics developed by Vincas Svirskis. According to Vytautas Ulevičius, Vincas Svirskis, whose talent has not been surpassed to this day, is a great authority to him, because he carved the way he wanted, even though his statues were not liked by everyone.